Scooper - Technology News: What's your workplace thinking style? 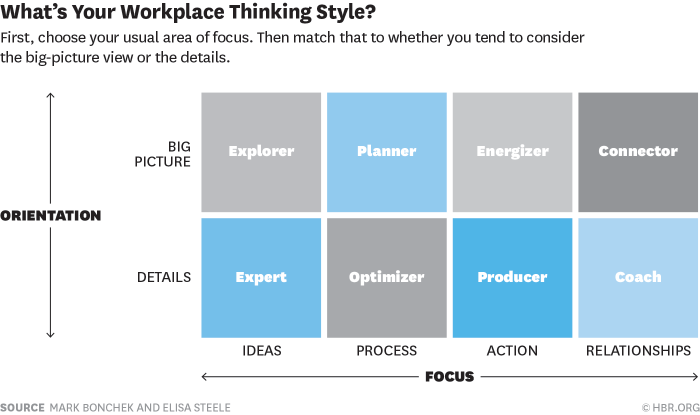 What's your workplace thinking style? Are you an optimizer or a connector? An explorer or an expert? Pinpointing exactly what type of thinker you are could help not only you, but your entire organization, argue two experts in an article for Harvard Business Review . Most organizations use a standard set of tools to form, manage and motivate teams. However, they often overlook how people think. “Today’s marketplace, the smartest companies aren’t those that necessarily out-produce the competition. Instead, it’s the organizations that outthink them,” Mark Bonchek and Elisa Steele write. The authors highlight research that shows effective collective thinking has a major influence on performance. However, while it’s (normally) clear what our colleagues are doing, how they think is much harder to define. They argue, by understanding how you and the rest of the team is thinking, we could all be more energized, more creative, more productive and make better decisions. To help us, the authors have created a three-step process for defining how you and your team think. So how do you think? Step number one: Where does your thinking focus? Do you zero in on the idea, the process, the action, or relationships? It’s not about picking one over another, it’s about where you naturally focus. Step number two: Where does your thinking orient? Towards the big picture or the detail? Step number three: Combine these using the chart below to see your thinking style. · Explorer thinking is about generating creative ideas. · Planner thinking is about designing effective systems. · Energizer thinking is about mobilizing people into action. · Connector thinking is about building and strengthening relationships. · Expert thinking is about achieving objectivity and insight. · Optimizer thinking is about improving productivity and efficiency. · Producer thinking is about achieving completion and momentum. · Coach thinking is about cultivating people and potential. Once you know your style, it’ll become clear what gets you out of bed in the morning, what challenges you and how you can improve. You and your team can then share your styles. “In this way, your thinking style becomes a useful tool – a kind of social currency – for the team,” they argue. From here you can build more effective, collaborative teams, who make better decisions – for both themselves individually, and also the company. They conclude that businesses need to incorporate thinking into their team forming, motivation and management. Certainly something to think about.